String Sextets: No. 1 in B flat, Op. 18 (1860) [36�22]; No. 2 in G, Op. 36 (1864/5) [39�17]. Hausmusik London (Monica Huggett, Pavlo Beznosiuk, violins; Roger Chase, Jeremy Williams, violas; Richard Lester, David Watkin, cellos). The impression Brahms gives of working with a new, larger scale of conception which is at once relaxed yet taut of musical argument is one of the miracles of the two string sextets, works whose stature, perhaps, still has to be fully appreciated. This is despite some fine performances that have graced the catalogue (the Raphael Ensemble on Hyperion also provide much pleasure, for example). Few are fresher than these performances by Hausmusik, London, though. 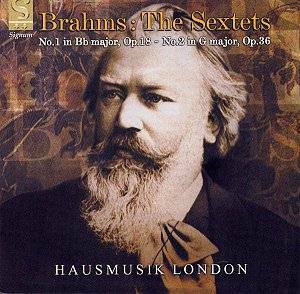 Part of the key to Hausmusik�s success is the fact that they play on period instruments, which lightens textures and lets Brahms� supreme thematic interplay breathe with real clarity. Far from being harsh and abrasive, Hausmusik sheds an entirely new light on these works. Of course, a similarly clear recording helps and Floating Earth�s efforts in this regard are exemplary. The First Sextet, as Robert Pascall�s excellent booklet notes point out, is in many ways a successor to Brahms� orchestral Serenades (works which should also be accorded more exposure). The first movement breathes real serenity, but the second is even more impressive: note that Brahms was so enamoured of this Andante that he arranged it for solo piano in 1860. Hausmusik London gives it a fine, beautifully etched yet heartfelt performance (QUOTE 1). The tiny (three-minute) Scherzo is imbued with contained energy. The drama surfaces more obviously in the finale. The G major Sextet inhabits a very interior world, its aching harmonies being both disturbing yet fascinating (QUOTE 2). It was written in 1864/5, but its roots go further back than this. Here the Scherzo is placed second, again shadowy but nevertheless rhythmically alive (QUOTE 3). Only in the finale do we hear some awkwardness in these otherwise excellent performances: there is some strain felt in the accompanying violin passages. A small qualifier to a product that will give much pleasure.